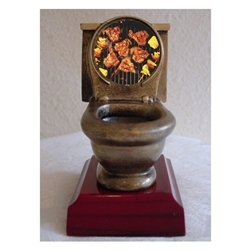 Grilling Toilet Trophies. This makes the perfect award for the first or last place BBQ Cook Off Contest. Item measures 5". For added height, you can also add a 2" high black marble base or 4" high walnut wood base if you like.